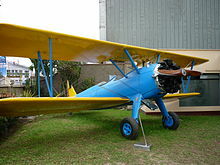 The Stearman (Boeing) Model 75 is a biplane used as a military trainer aircraft, of which at least 9,783 were built in the United States during the 1930s and 1940s. 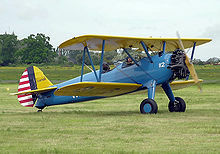 Stearman Aircraft became a subsidiary of Boeing in 1934. Widely known as the Stearman, Boeing Stearman or Kaydet, it served as a primary trainer for the USAAF, as a basic trainer for the USN (as the NS & N2S), and with the RCAF as the Kaydet throughout World War II. After the conflict was over, thousands of surplus aircraft were sold on the civil market. In the immediate post-war years they became popular as crop dusters and as sports planes. Picture - WAVE in a Boeing Stearman N2S US Navy training aircraft. The Kaydet was a conventional biplane of rugged construction with large, fixed tailwheel undercarriage, and accommodation for the student and instructor in open cockpits in tandem. The radial engine was usually uncowled, although some Stearman operators choose to cowl the engine, most notably the Red Baron Stearman Squadron. Because the design of the Stearman's propeller is unusual, reaching the speed of sound in normal operation, the sound of the plane stands out from other, similar aircraft, and is considered something of a trademark. Picture - US Navy N2S-2 at NAS Corpus Christi, 1943. After World War II, the thousands of PT-17 Stearmans were auctioned off to civilians and former pilots. Many were modified for cropdusting use, with a hopper for pesticide or fertilizer fitted in place of the front cockpit. Additional equipment included pumps, spray bars, and nozzles mounted below the lower wings. A popular approved modification to increase the maximum takeoff weight and climb performance involved fitting a larger Pratt & Whitney R-985 engine and a constant speed propeller. PT-13, with a Lycoming R-680 engine. 2,141 total all models. PT-13Initial production. R-680-B4B engine. 26 built. PT-13A R-680-7 engine. 92 delivered 1937-38. Model A-75. PT-13B R-680-11 engine. 255 delivered 1939-40. PT-13C Six PT-13Bs modified for instrument flying. PT-13D PT-13As equipped with the R-680-17 engine. 353 delivered. 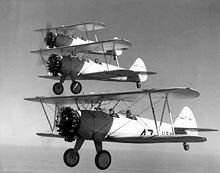 Picture - US Navy NS-1s of the NAS Pensacola Flight School, 1936. Picture - Boeing Stearman E75 (PT-13D) of 1944. PT-17A 18 PT-17s were equipped with blind-flying instrumention. PT-17B Three PT-17s were equipped with agricultural spraying equipment for pest-control. PT-13 with a Jacobs R-755 engine, 150 built. PT-18A Six PT-18s fitted with blind-flying instrumention. Picture - Boeing Stearman (PT-13) of the Israeli Air Force. PT-27 Canadian PT-17. This designation was given to 300 aircraft supplied under Lend-Lease to the RCAF. Up to 61 delivered. powered by surplus 220 hp (164 kW) Wright J-5 Whirlwind. N2S Known colloquially as the "Yellow Peril" from its overall-yellow paint scheme. N2S-1 R-670-14 engine. 250 delivered to the US Navy. N2S-2 R-680-8 engine. 125 delivered to the US Navy. N2S-3 R-670-4 engine. 1,875 delivered to the US Navy. N2S-4 99 US Army aircraft diverted to the US Navy, plus 577 new-build aircraft. N2S-5 R-680-17 engine. 1,450 delivered to the US Navy. Picture - US Navy N2S ambulance at NAS Corpus Christi, 1942. (a.k.a. X70) The Wright Field XPT-943 based on the Stearman 6 Cloudboy. Civil production of the NS and PT-13. (a.k.a. X75) Evaluated by the army as a Primary trainer. The X75L3 became the PT-13 prototype. Variants of the 75 formed the PT-17 family. Export trainer and armed versions of the 75. (a.k.a. X90 &amp; X91) Productionised metal framed version becoming the XBT-17. The X70 evaluated at Wright Field. Picture - Boeing Stearman PT-17, Museum of Historical Studies Institute of Aerospace in Perx� - Lima. A considerable number of Stearmans remain in flying condition throughout the world, as the type remains a popular sport plane and warbird. PT-13D (s/n 42-17800) is on display at the National Museum of the United States Air Force in Dayton, Ohio. This aircraft is the last Kaydet produced. 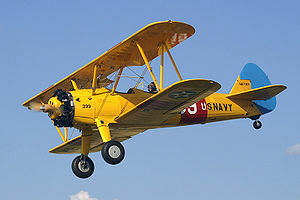 It was donated in 1959 by the Boeing Aircraft Company, which purchased the Stearman Company in 1938. PT-17 (26) owned by British actor Martin Shaw flies from Old Buckenham airfield in Norfolk. 75-3130 is on display in the hangar deck of the USS Yorktown (CV-10) at The Patriot's Point Naval and Maritime Museum in Charleston, SC. The Canadian Warplane Heritage Museum near Hamilton, Ontario, is the owner and operator of a PT-17 built in 1942 running with a Continental W-670-6N engine. 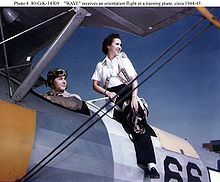 A PT-17 in which George H.W. Bush once flew as part of his navy training is on display at the Pacific Aviation Museum, on Ford Island, Pearl Harbor. Mexican Air Force at its Zapopan Air Base currently operates 4 PT-17, using them for parades. TG Aviation based in Kent International Airport in Kent, UK also operate a Boeing Stearman, it can often be seen at local air shows. Wild Blue Aviation Co. flies a restored PT-17 (#464) for aerobatic rides in Fayetteville, WV. PT-17 on display Carolinas Aviation Museum, Charlotte, North Carolina. PT-17 on display Instituto de Estudios Histx�ricos Aeroespaciales del Perx�, Miraflores, Lima, Perx�. Avis, Jim and Bowman, Martin. 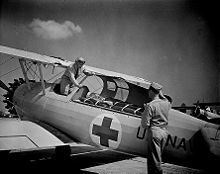 Stearman: A Pictorial History. Motorbooks, 1997. ISBN 0-76030-479-3.